A driver has finally admitted being responsible for the death of a south Warwickshire woman who died five days after she was severely injured in a crash in Wellesbourne. Matthew Keen had originally denied causing the death of 33-year-old passenger Amanda Emmott by dangerous driving, and was due to stand trial at Warwick Crown Court later this month. But at a pre-trial hearing, his barrister Justin Jarmola asked for him to be re-arraigned on that charge, and Keen (32) of Hamlet Way, Stratford, then changed his plea to guilty. Accepting that plea, prosecutor Graeme Simpson said he would not ask for Keen to stand trial on a further charge of causing serious injury to another passenger, Lee Fearnehough. 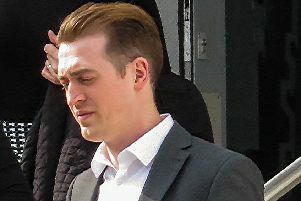 Mr Simpson explained that although Mr Fearnehough described suffering suspected fractured ribs in the crash, there was no medical evidence that they had actually been fractured. The charges followed a crash on the A429 just north of Wellesbourne at about 6pm on October 24, 2015, when Keen’s silver-coloured VW Golf left the road at speed on a bend. The Golf, in which Miss Emmott was the rear-seat passenger, smashed through a wall and went into a ditch near the Horticultural Research Centre, where it rolled over before landing back on its wheels. Ambulance crews were at the scene within minutes and found Miss Emmott out of the car, but in pain and suffering from massive internal injuries. She was rushed to the trauma unit at University Hospital in Coventry, but despite efforts to save her, she died from her injuries. Mr Fearnehough, the front seat passenger, had to be freed from the car with the aid of the Fire Brigade before he was also rushed to hospital with suspected chest injuries. Keen had fled from the scene by the time the emergency services arrived, but voluntarily attended Stratford police station the next day. Miss Emmott, who was from Shipston-on-Stour, tragically died in hospital five days after the crash, and Keen was subsequently charged with causing her death by dangerous driving. When he first appeared at the crown court in August last year, before he later entered not guilty pleas, it was indicated that Keen denied being responsible for Miss Emmott’s death – and it was even suggested there might be an application to dismiss the charge. After he entered his guilty plea, Mr Jarmola asked for the case to be adjourned for a pre-sentence report to be prepared. Agreeing to adjourn for a report and granting Keen bail, Judge Andrew Lockhart QC told him: “You have pleaded guilty to this charge, and you will receive the appropriate level of credit for that plea. Judge Lockhart also imposed an interim driving ban on Keen, and the eventual length of the disqualification will be determined when he is sentenced. But the judge was unmoved, and said it would not be appropriate for the disqualification to be anything other than immediate.